Instead of reaching the Santa standing by at the Sears Toyland, the children of Colorado Springs had instead connected with one of America’s most sensitive military installations. “[Shoup] called AT&T and said to give Sears that phone number and get him a new one, but in the meantime he had to have servicemen answer the calls,” says Van Keuren. When President Dwight D. Eisenhower formed CONAD in 1954 to provide early warning of an aerial attack from enemies such as the Soviet Union, he tasked the joint military command with scanning the skies for “reds” flying bomber planes, not a man in a red suit. “There may be a guy called Santa Claus at the North Pole, but he’s not the one I worry about coming from that direction,” Shoup later told the International News Service. Still, the wrong number put the Colorado command post in a Yuletide mood and sparked a festive idea to soften its hard-edged public image. After all, that year’s Christmas message from CONAD’s commander-in-chief, four-star General Earle E. Partridge, wasn’t exactly full of glad tidings. “Although Christmas is the time when all Christians should exemplify a spirit of love, tolerance and understanding, we must listen for the harsher sounds of the world we live in,” he told his troops. With an eye toward making its mission a little less scary to the American public, CONAD issued a press release that appeared in newspapers around the country on Christmas Eve letting “good little boys and girls” know that it was tracking a big red sleigh approaching from the North Pole. The command said that first reports from its radar and ground observation outposts indicated that Santa Claus was traveling at 45 knots per hour at an altitude of 35,000 feet. The release also contained a bit of propaganda that reassured children that American forces would “guard Santa and his sleigh on his trip to and from the U.S. against possible attack from those who do not believe in Christmas.” That was a clear allusion to the atheistic Soviets and their fellow Communists. When Shoup visited his troops on Christmas Eve to distribute cookies, he looked up at the three-story-tall map of the North American continent that dominated the operations center to see that someone had sketched Santa’s sleigh descending from the North Pole alongside the unidentified objects detected in American airspace. The idea for the Santa Tracker was born as Shoup looked at that map, on December 24, 1955. According to Van Keuren, her father always had a knack for public relations, so he arranged a phone call with a local radio station to report that CONAD had spotted an unidentified flying object that looked like a sleigh. Other radio stations then began to phone in to get the latest update on Santa’s location, and a Christmas tradition was cemented. “The wires went nuts, and it got bigger and better every year,” Van Keuren says of the Santa tracking operation. Shoup became known as the “Santa colonel,” a nickname he embraced with pride. 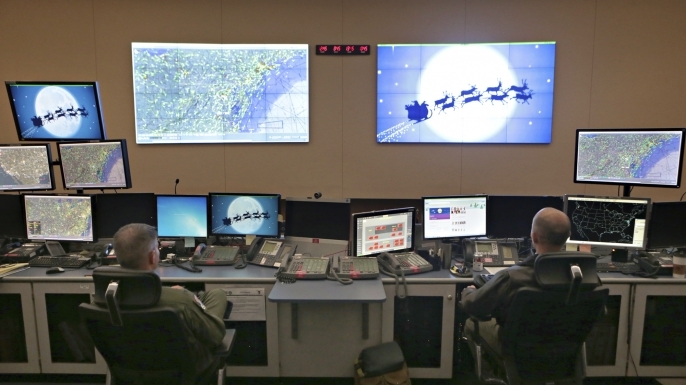 Now officially known as “NORAD Tracks Santa,” the operation has evolved with technology and the times. During the 1960s, NORAD mailed vinyl records to radio stations that featured pre-recorded reports on Santa’s progress and holiday music from its in-house orchestra. In the 1970s, NORAD took to the airwaves with television commercials. In the digital age, St. Nick’s real-time progress can be monitored on social media, on smartphones and tablets through the official app, and on the NORAD Tracks Santa website, which is available in eight languages. As of 2017, Amazon Echo users can ask Alexa for Santa’s whereabouts. According to Royal Canadian Navy Lieutenant Marco Chouinard, a NORAD spokesperson, more than 1,500 active-duty military and civilian volunteers from the United States and Canada, including Shoup’s daughter Van Keuren, will spend this Christmas Eve in Colorado Springs fielding inquiries from around the world. “In some cases, three generations have been doing this. It’s part of their Christmas tradition,” Chouinard says. With more than 150,000 calls expected this year, the phones are sure to be jingling at NORAD just as they were in 1955. Only this time, the hotline won’t bring any surprises.